On May 20, Bolivian President Evo Morales issued Supreme Decree 2366, opening up Bolivia’s national parks—which are protected under the Constitution as ecological reserves—to oil and gas extraction. Just two weeks later, Morales proclaimed that his on-again, off-again plan to build a highway through the TIPNIS national park and indigenous territory in the Bolivian Amazon will finally be realized. The coincidence of these announcements was not lost on TIPNIS road opponents, who have long suspected that the advancement of oil and gas interests is a major impetus behind the road. Within the TIPNIS, four areas covering 30% of the park’s territory are subject to long-standing hydrocarbons concessions. The Securé block is virtually adjacent to the proposed road. In fact, 11 of Bolivia’s 22 national park reserves are overlapped by existing gas and oil concessions to transnationals like Brazil’s Petrobras, Spain’s Repsol, and France’s Total. Since the “nationalization” of hydrocarbons in 2006, these companies have operated through joint ventures with YPFB, the state energy company. Like the TIPNIS, many of these reserves are collectively titled to indigenous groups who have inhabited them for centuries, relying on their ancestral lands for subsistence. In some cases, hydrocarbons concessions cover 70-90% of the park’s territory. These parks could become virtually extinct once the contracts are operational. While the land area conceded to gas and oil companies in Bolivia has vastly expanded under Morales—up from 7.2 million acres in 2007 to 59.3 million in 2012—activity in the national parks has been largely paralyzed due to the lack of a coherent regulatory framework for extraction—until now. Under the new Supreme Decree, permits for hydrocarbons extraction can be granted under existing or new contracts, as long as the company promises to mitigate any adverse environmental impacts, and contributes 1% of its investment towards poverty reduction and economic development in the affected area. Critics say these measures won’t begin to compensate for the true costs of hydrocarbons exploitation, especially since the environmental and parks agencies responsible for administering them are strongly biased towards extraction. According to Jorge Campanini of the non-profit research organization CEDIB, Supreme Decree 2366 will be a “terminal sentence” for protected areas already under assault from illegal mining, deforestation, and land invasions by coca-growers. Morales’s twin announcements highlight a central challenge and contradiction for the MAS (Movement Towards Socialism) government, which has relied heavily on oil and gas extraction to finance its successful redistributive programs. 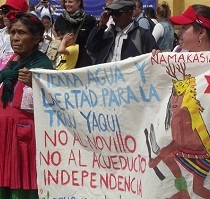 This strategy has increasingly put Morales at odds with indigenous, environmental, and other civil society organizations who argue that extractivism destroys nature and communities, perpetuates dependence on transnationals, and obscures the need to develop a sustainable economic model for the future. In contrast, the MAS government defends its extractivist and developmentalist policies as a necessary means to alleviate poverty in the present, and to create the resources for a post-extractive economy that will transition towards “communitarian socialism.” Political scientist George Gray Molina has noted that the Bolivian government’s effective take of hydrocarbons taxes and royalties, at 72%, is among the highest in Latin America. These contrasting visions crystallized in 2011-12 around the TIPNIS controversy, the most divisive conflict of Morales’s nine-year tenure. The protracted dispute ruptured the alliance of indigenous, campesino, and urban social movements that originally brought Morales to power in 2005. Morales put the road on hold ahead of the 2014 presidential election, in favor of a well-timed government campaign to eliminate extreme poverty in the TIPNIS. He also publicly expressed regrets about the government’s flawed community consultation process. Still, he has consistently defended the road’s geopolitical importance in promoting territorial integration and regional development. Few were surprised by the project’s resurrection, especially since Morales contracted with a state company to begin construction on the initial road segment leading up to the park in 2012, with government funds. Morales’s decision to expand the hydrocarbons frontier into Bolivia’s national parks was also not unexpected. Vice-president Alvaro García Linera offered a preview in May 2013, invoking the theme of resource nationalism to justify the policy as an “anti-imperialist strategy.” Past neoliberal governments, he argued, protected these reserves to safeguard their resources for the future benefit of foreign investors, ensuring that Bolivia would remain in a state of underdevelopment. Morales’s decision to move forward now on both the TIPNIS and hydrocarbons fronts reflects a confluence of several factors. Economically, the dramatic decline in international oil prices (which also lowers the market price of Bolivia’s gas), along with the recently documented drop in the level of Bolivia’s proven gas reserves, has created a sense of urgency to expand the hydrocarbons frontier. With 80% of Bolivia’s gas currently exported to Brazil and Argentina, there is also a long-postponed need to expand the supply of gas for domestic uses, including industrialization. And in his recent presidential campaign, Morales promoted the vision of Bolivia as a regional energy power, promising to develop new markets for gas exports. Politically, Morales’s landslide victory last October, with 61% of the popular vote and wins in 8 of Bolivia’s 9 departments, was based on a newly-configured alliance of rural peasants, small producers and merchants, an emerging urban indigenous entrepreneurial bourgeoisie, and elements of conservative elite sectors who have been integrated into the MAS. 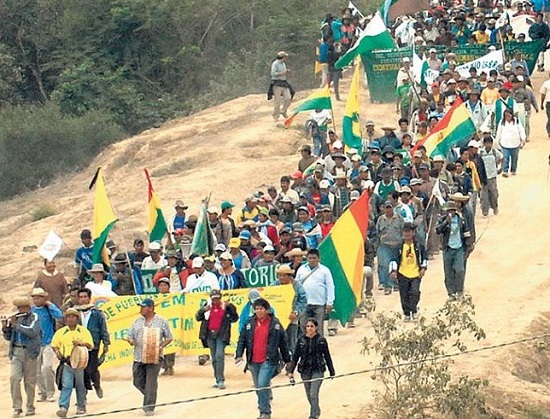 This coalition, which has reshaped Bolivia’s political landscape, has substantially benefited from Bolivia’s gas-fueled prosperity and provides a broad mandate for Morales’s neo-developmentalist and extractivist policies. 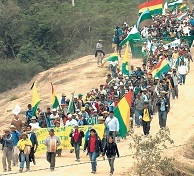 As for the TIPNIS, the MAS party’s first-ever triumph in the Beni department’s gubernatorial elections—albeit after the MAS-controlled electoral commission decertified the popular rival opposition party 9 days before the vote—has created a newly favorable local political climate for constructing the Beni–Cochabamba road. And the MAS party’s two-thirds control of the Plurinational Legislative Assembly will assure the votes needed to repeal the inconvenient 2011 law protecting the TIPNIS as an “untouchable” zone. While the road’s design and financing sources have yet to be determined, Morales has indicated that the Binational Social Engineering Corps, a joint venture between the Bolivian and Venezuelan military, is prepared to start construction. Just how much push-back there will be against these initiatives remains to be seen. Groups opposed to the prevailing MAS policies have been marginalized, intervened, divided, deprived of resources, and badly weakened by the Morales government in the wake of the TIPNIS conflict. And, as anthropologist Bret Gustafson has noted, an anti-extractivist position is difficult to maintain in a country where gas is viewed primarily through the lens of resource nationalism, and as a ticket to economic prosperity. Still, TIPNIS leader Fernando Vargas, former presidential candidate for Bolivia’s Green Party, and Adolfo Chávez, leader of the lowland indigenous federation CIDOB, have announced plans for a legal challenge to Supreme Decree 2366, an international mobilization in defense of Bolivia’s national parks, and a hoped-for audience with the Pope when he visits Bolivia in July. They will need all the help they can get.